For the Australian artist who used the pseudonym "Phidias" in radio talks, see Jeffrey Smart. Phidias or Pheidias (/ˈfɪdiəs/; Greek: Φειδίας, Pheidias; c. 480 – 430 BC) was a Greek sculptor, painter, and architect. His statue of Zeus at Olympia was one of the Seven Wonders of the Ancient World. Phidias also designed the statues of the goddess Athena on the Athenian Acropolis, namely the Athena Parthenos inside the Parthenon, and the Athena Promachos, a colossal bronze which stood between it and the Propylaea, a monumental gateway that served as the entrance to the Acropolis in Athens. Phidias was the son of Charmides of Athens. The ancients believed that his masters were Hegias and Ageladas. Plutarch discusses Phidias' friendship with the Greek statesman Pericles, recording that enemies of Pericles tried to attack him through Phidias – who was accused of stealing gold intended for the Parthenon's statue of Athena, and of impiously portraying himself and Pericles on the shield of the statue. The historical value of this account, as well as the legend about accusations against the 'Periclean circle', including Aspasia and Anaxagoras, is debatable, but Aristophanes mentions an incident with Phidias around that time. Phidias is often credited as the main instigator of the Classical Greek sculptural design. Today, most critics and historians consider him one of the greatest of all ancient Greek sculptors. Although no original works exist that can be attributed to Phidias with certainty, numerous Roman copies of varying degrees of fidelity are known to exist. This is not uncommon. Almost all classical Greek paintings and sculptures have been destroyed, and only Roman copies or notes of them exist, like the passages of Plato that ascribe Phidias' works to him. The ancient Romans frequently copied and further developed Greek art. In antiquity Phidias was celebrated for his statues in bronze and his chryselephantine works (statues made of gold and ivory). In the Hippias Major, Plato claims that Phidias seldom, if ever, executed works in marble, though many of the sculptures of his time were executed in marble. Plutarch writes that he superintended the great works ordered by Pericles on the Acropolis. Ancient critics take a very high view of the merits of Phidias. What they especially praise is the ethos or permanent moral level of his works as compared with those of the later so called "pathetic" school. Both Pausanias and Plutarch mention works of his depicting the warlike Athena Areia. Demetrius calls his statues sublime, and at the same time precise. Of his life we know little apart from his works. His first commission created a group of national heroes with Miltiades as a central figure. In 447 BC, the Athenian statesman Pericles commissioned several sculptures for Athens from Phidias to celebrate the Greek victory against the Persians at the Battle of Marathon during the Greco-Persian Wars (490 BC). Pericles used some of the money from the maritime League of Delos, to rebuild and decorate Athens to celebrate this victory. Inscriptions prove that the marble blocks intended for the pedimental statues of the Parthenon were not brought to Athens until 434 BC, which was probably after the death of Phidias. It is therefore possible that most of sculptural decoration of the Parthenon was the work of Phidias' workshop including pupils of Phidias, such as Alcamenes and Agoracritus. (phi), after Phidias, who is said to have employed it. The golden ratio is the irrational number 1 + √5/2, approximately equal to 1.618, which has special mathematical properties. The earliest of the works of Phidias were dedications in memory of Marathon, celebrating the Greek victory. At Delphi he created a great group in bronze including the figures of Greek gods Apollo and Athena, several Attic heroes, and General Miltiades the Younger. On the Acropolis of Athens Phidias constructed a colossal bronze statue of Athena, the Athena Promachos, which was visible far out at sea. Athena was the goddess of wisdom and warriors and the protector of Athens. At Pellene in Achaea, and at Plataea Phidias made two other statues of Athena, as well as a statue of the goddess Aphrodite in ivory and gold for the people of Elis. For the ancient Greeks, two works of Phidias far outshone all others, the colossal chryselephantine Statue of Zeus (c. 432 BC) which was erected in the Temple of Zeus at Olympia, Greece, and the Athena Parthenos (lit. "Athena the Virgin"), a sculpture of the Greek virgin goddess Athena, which was housed in the Parthenon in Athens. Both sculptures belong to about the middle of the 5th century BC. A number of replicas and works inspired by it, both ancient and modern, have been made. Upon completing the Athena Parthenos sculpture, Phidias was accused of embezzlement. Specifically, he was charged with shortchanging the amount of gold that was supposed to be used in the statue and keeping the extra for himself. Plutarch writes that Phidias was imprisoned and died in jail. Philochorus, however, says that Phidias went to Elis, where he worked on the colossal Statue of Zeus at Olympia. It seems that the embezzlement charge was politically motivated; a result of his friendship with Pericles, who had many enemies in Athens. From the late 5th century BC, small copies of the statue of Zeus found on coins from Elis, which give a general notion of the pose and the character of the head. The god was seated on a throne, every part of which was used for sculptural decoration. His body was of ivory, his robe of gold. His head was of somewhat archaic type: the bust of Zeus found at Otricoli, which used to be regarded as a copy of the head of the Olympian statue, is certainly more than a century later in style. According to geographer Pausanias (1.28.2), the original bronze Athena Lemnia was created by Phidias (c. 450–440 BC) for Athenians living on Lemnos. He described it as "the best of all Pheidias's works to see". Adolf Furtwängler suggested that he found a copy of the Athena Lemnia in a statue of which the head is located in Bologna and the body is at Dresden. Some 5th-century BC torsos of Athena have been found at Athens. The torso of Athena in the École des Beaux-Arts at Paris, which has unfortunately lost its head, gives some idea of what the original statue may have looked like. A significant advancement in the knowledge of Phidias' working methodology came during 1954–58 with the excavation of the workshop at Olympia where Phidias created the Statue of Zeus at Olympia. Tools, terracotta molds and a cup inscribed on the bottom "Φειδίου εἰμί" (Pheidíou eimí) – "I belong to Phidias"; literally: "of Phidias’ [Genitive: Φειδίου] I am [εἰμί]", placing the more important word first) were found here, just where the traveller Pausanias said the statue was constructed. The discovery has enabled archaeologists to re-create the techniques used to make the statue and confirm its date. There are discrepant accounts of Phidias' death. According to Plutarch, he was made an object of attack by the political enemies of Pericles, and died in prison at Athens. 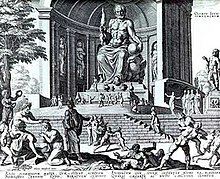 According to Philochorus, as quoted by a scholiast on Aristophanes, he was put to death by the Eleans after he had completed the Statue of Zeus for them. 4753 Phidias, a main-belt asteroid named after Phidias. ^ "Ageladas | Greek sculptor". Encyclopedia Britannica. Retrieved 2019-02-24. ^ Plutarch. Life of Pericles, 31. ^ Filonik, Jakub (2013). "Athenian impiety trials: a reappraisal" (PDF). Dike (16): 26–33. doi:10.13130/1128-8221/4290. ^ Spivey, Nigel (1996). Understanding Greek sculpture : ancient meanings, modern readings. New York: Thames and Hudson. p. 154. ISBN 0500278768. OCLC 36645523. 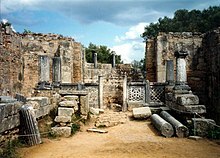 ^ The Delian team was an association of approximately 150 Greek city-states under the leadership of Athens, whose purpose was to continue fighting the Persian Empire. ^ Spivey, Nigel (1996). Understanding Greek sculpture : ancient meanings, modern readings. New York: Thames and Hudson. p. 158. ISBN 0500278768. OCLC 36645523. ^ Clayton, Peter A; Price, Martin (2013). The Seven Wonders of the Ancient World. Routledge. pp. 62–63. ISBN 978-1-136-74810-3. Chisholm, Hugh, ed. (1911). "Pheidias" . Encyclopædia Britannica (11th ed.). Cambridge University Press. This article incorporates text from a publication now in the public domain: Chisholm, Hugh, ed. (1911). "Pheidias" . Encyclopædia Britannica. 21 (11th ed.). Cambridge University Press. Andrew Stewart, One Hundred Greek Sculptors: Their Careers and Extant Works, Part III of Stewart's Greek Sculpture, (Yale University Press) (on-line text at Perseus[permanent dead link]).